The Birmingham Americans were undefeated at 6-0 as they took on the reeling Jacksonville Sharks in a World Football League game on August 21, 1974. Head Coach Jack Gotta’s team featured ten-year veteran George Mira at quarterback and, as his backup, Matthew Reed (pictured above), who was proving to be effective coming off the bench. Reed, a big quarterback at 6’4” and 230 pounds, had been a very productive passer at Grambling but could only get tryouts at tight end in the NFL with Buffalo, Denver, and New Orleans, and was originally signed by the Americans at that position. Both quarterbacks were helped by the presence of two productive wide receivers in Dennis Homan and Alfred Jenkins. For the Sharks, it was the first game for Charlie Tate as head coach in place of Bud Asher, who was dismissed after the team’s record dropped to 2-4 the previous week. 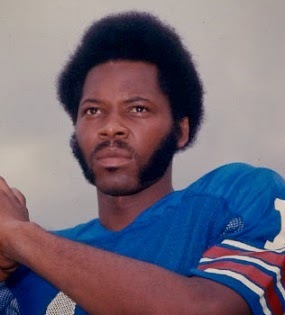 RB Tommy Durrance was leading the WFL in rushing with 443 yards, and rookie Reggie Oliver from the University of Miami was a promising quarterback, when healthy. But while there was plenty of experience on the roster, the Sharks were having trouble winning close contests. It was a rainy Wednesday night at the Gator Bowl with 27,140 fans in attendance. Neither offense performed well during the first half. Grant Guthrie kicked a field goal from 31 yards late in the first quarter to stake the Sharks to the lead and added another from 51 yards in the third quarter. Five times during the first three periods the Jacksonville defense stopped Birmingham drives inside its 25 yard line. Safety Ron Coppenbarger had two fumble recoveries and an interception to cap three of those stops. The score remained 6-0 heading into the fourth quarter, at which point the steady rain finally stopped. In addition, Matthew Reed had come in at quarterback for the Americans after George Mira reinjured his ankle. Early in the final period, Reed connected with Alfred Jenkins for a 27-yard touchdown that finished off a five-play, 40-yard series. The Americans failed to add the action point, but were ahead by 7-6 (in the WFL, touchdowns counted for seven points and were followed by an “action point” that could not be kicked). The teams exchanged punts before Jacksonville put together an 88-yard drive that put them ahead by 14-7 with just over a minute remaining. Tommy Durrance ran the final five yards for the touchdown, to the delight of the home crowd. The series included a successful fourth down conversion in their own territory and Reggie Oliver completed four passes along the way. The Sharks failed to add the action point, but were in front and seemed poised for an upset. The ensuing kickoff was short and returned to the Jacksonville 47 by RB Jimmy Edwards, who nearly broke free. With time running down, Reed tossed a screen pass to HB Paul Robinson for 11 yards and a throw to WR Denny Duron gained another 11. Reed, under pressure, completed a pass to TE Jim Bishop that picked up 19 yards to the Jacksonville six and, three plays later, the Americans scored again with 19 seconds left on the clock when FB Charlie Harraway bulled over for a touchdown from two yards out. Reed rolled out and ran for the all-important action point and the Americans pulled out the dramatic win by a final score of 15-14. Birmingham outgained the Sharks (315 yards to 200) and had more first downs (19 to 12). The Americans turned the ball over three times, to two suffered by Jacksonville. Reed completed 7 of 12 passes for 97 yards and a touchdown with no interceptions. George Mira was successful on just 6 of 17 throws for 68 yards and was picked off once. Jimmy Edwards rushed for 62 yards on 9 carries and Charlie Harraway was right behind at 60 yards on 13 attempts that included a TD. Dennis Homan caught four passes for 55 yards and Alfred Jenkins contributed three catches for 48 yards and a score. For the Sharks, Reggie Oliver made good on 7 of 17 passes for 108 yards and was intercepted twice. Tommy Durrance gained 42 yards on 16 rushing attempts that included a touchdown and RB Ricky Lake accumulated 35 yards on 13 carries. WR Tom Whittier caught three passes for 61 yards. Birmingham went on to place second in the Central Division at 15-5 and proceeded to win the first (and only) WFL Championship. The Sharks failed to last the season. Despite respectable fan support, the team was woefully mismanaged and folded after fourteen weeks with a 4-10 record. Matthew Reed continued to excel in a relief role at quarterback and passed for 1345 yards and 11 touchdowns. He also rushed for 176 yards on 40 carries that included three for scores.